Adjuvants enhance and direct the adaptive immune response to vaccine antigens through various mechanisms, some of which are still poorly understood. Recently, STING and more generally the host nucleic acid sensing machinery were shown to play an essential role in vaccination. Aluminum salt formulations (referred to as alum) have been used for decades as effective and safe vaccine adjuvants. Alum mostly potentiates IgG1 and IgE production through the promotion of Th2 cell responses. It has long been known that alum causes cell death and the release of numerous molecules that act as damage-associated molecular patterns (DAMPs). Two of these DAMPs, which are both connected to nucleic acid biology, have been identified. Uric acid , which is the end product of the degradation of purines, and host cell DNA  have been shown to accumulate at sites of alum injection and to induce T cell responses and the production of IgG1 and IgE. The signaling pathways activated by uric acid in this context have not been identified, nor the cytosolic DNA sensor(s) triggered by host DNA in alum immunization [1, 2]. However, the (STING)-TBK1-IRF3 axis has been shown to control the IgE response . The STING-TBK1-IRF3 axis has also been involved in the adjuvant activity of c-di-GMP. Cyclic-di-GMP is a bacterial signaling molecule with strong immunostimulatory activity, which is currently being investigated as a mucosal adjuvant [3, 4]. Several studies have shown that intranasal immunization with c-di-GMP promotes predominantly Th1 responses, essential for the elimination of intracellular pathogens. Although its adjuvancy mechanism is not yet understood, c-di-GMP is known to activate the innate immune system  and induce the production of type I IFNs through STING-TBK1-IRF3 , the same signaling pathway used by intracellular DNA. According to a very recent study, c-di-GMP is recognized by the cytosolic DNA sensor DDX41  and not by STING directly, as previously thought .The data suggest that DDX41 binds to c-di-GMP then forms a complex with STING to facilitate downstream signaling and the activation of type IFNs. 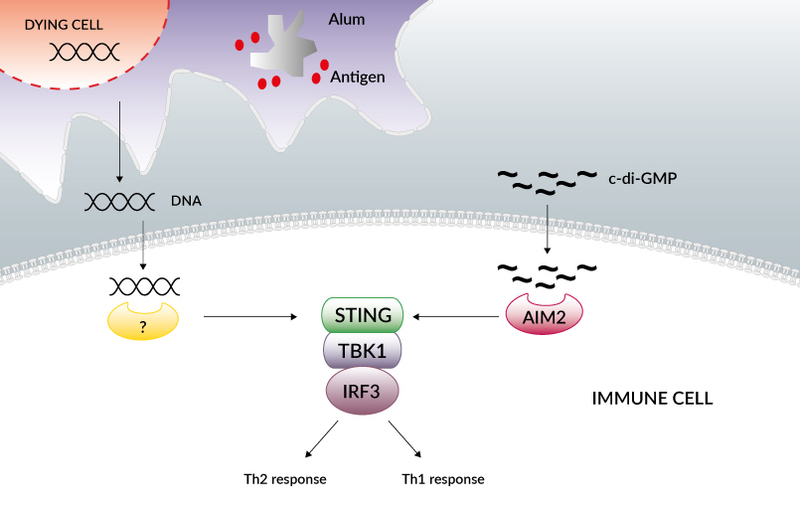 It is intriguing that the STING-TBK1-IRF3 signaling pathway can promote two distinct Th responses. 1. Kool M. et al., 2008. Alum adjuvant boosts adaptive immunity by inducing uric acid and activating inflammatory dendritic cells. J Exp Med. 205(4):869-82. 2. Marichal T. et al., 2011. DNA released from dying host cells mediates aluminum adjuvant activity. Nat Med. 17(8):996-1002. 3. Chen W. et al., 2010. The potential of 3',5'-cyclic diguanylic acid (c-di-GMP) as an effective vaccine adjuvant. Vaccine. 28(18):3080-5 (review). 4. Pedersen GK. et al., 2011. Evaluation of the sublingual route for administration of influenza H5N1 virosomes in combination with the bacterial second messenger c-di-GMP. PLoS One. 6(11):e26973. 5. Karaolis DK. et al., 2007. Bacterial c-di-GMP is an immunostimulatory molecule. J Immunol. 178(4):2171-81. 6. Jin L. et al., 2011. MPYS is required for IFN response factor 3 activation and type I IFN production in the response of cultured phagocytes to bacterial second messengers cyclic-di-AMP and cyclic-di-GMP. J Immunol. 187(5):2595-601. 7. Parvatiyar K. et al., 2012 The helicase DDX41 recognizes the bacterial secondary messengers cyclic di-GMP and cyclic di-AMP to activate a type I interferon immune response. Nat. Immunol. [Ahead of print]. 8. Burdette DL. et al., 2011. STING is a direct innate immune sensor of cyclic di-GMP. Nature. 478(7370):515-8.